David Wright Miliband (born 15 July 1965) is a British Labour Party politician, charity chief executive and public policy analyst who was the Secretary of State for Foreign and Commonwealth Affairs from 2007 to 2010  and the Member of Parliament (MP) for South Shields from 2001 to 2013. He and his brother, Ed Miliband, were the first siblings to sit in the Cabinet simultaneously since Edward, Lord Stanley, and Oliver Stanley in 1938. Born in London, Miliband studied at Oxford University and the Massachusetts Institute of Technology, after which he started his career at the Institute for Public Policy Research. Aged 29 he became Tony Blair's Head of Policy whilst the Labour Party was in opposition, and he was a contributor to Labour's manifesto for the 1997 election, which brought the party to power. Blair subsequently made him head of the Prime Minister's Policy Unit from 1997 to 2001, at which point Miliband was elected to Parliament for the seat of South Shields. 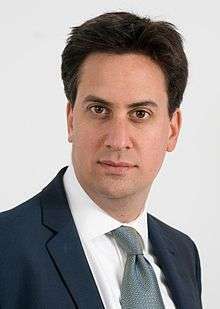 Born in London, Miliband is the elder son of Jewish immigrants, Belgian-born Marxist sociologist Ralph Miliband and Marion Kozak from Poland. He was given the middle name of "Wright" after the American sociologist C. Wright Mills, a friend of his father. He has said "I am the child of Jewish immigrants and that is a very important part of my identity." Both his Polish Jewish paternal grandparents lived in the Jewish quarter of Warsaw. His paternal grandfather, Samuel, a trained leather worker, served in the Red Army in the Polish–Soviet War of 1919–1921 before moving to Belgium. His paternal grandmother, Renia (later known as Renée), also moved to Belgium, where she first met Sam, and the couple married in 1923. The German invasion of Belgium in May 1940 split the Miliband family in half: Ralph and father Samuel fled to England, while Ralph's mother Renée and baby sister Nan stayed behind for the duration of the war. They were not reunited until 1950. His mother, a human rights campaigner and early CND member, survived the Holocaust thanks to being protected by Catholic Poles. During his visit to Poland in June 2009, Miliband went to his family tomb in the Jewish Cemetery in Warsaw. He said of Poland, "My mother was born here, her life was saved by those who risked theirs sheltering her from Nazi oppression", and that he is "one of the million Britons who have Polish blood". 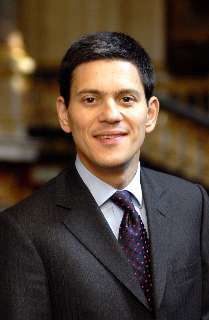 David Miliband was educated at Primrose Hill Primary School, in Camden, and Newlaithes Primary School, in Leeds. In September 1976, he passed the entrance examination to the newly independent, fee-paying Bradford Grammar School and in 1978 to 1983, following his father’s return to London, transferred to Haverstock Comprehensive School in North London. He obtained four A-levels (grades BBBD), and won admission to the University of Oxford. He studied at Corpus Christi College, Oxford, and obtained a first class honours degree in Philosophy, Politics and Economics. From 1988 to 1989 he took a master's degree in Political Science at Massachusetts Institute of Technology, where he was a Kennedy Scholar. On 5 May 2006 following the local elections Tony Blair made a major cabinet reshuffle in which Miliband replaced Margaret Beckett as Secretary of State for Environment, Food and Rural Affairs. Miliband has said he believes agriculture is important for the UK’s cultural heritage, economy and society and also for the environment. He has said disease control should be balanced with animal welfare. He attaches importance to reaching a "fair balance" among consumers, farmers, manufacturers and retailers. Miliband also believes the European Union and the World Trade Organisation affect power relations between British and foreign farmers. Miliband has floated the idea of every citizen being issued with a "Carbon Credit Card" to improve personal carbon thrift. Miliband claims individuals have to be empowered to tackle global warming — "the mass mobilising movement of our age". 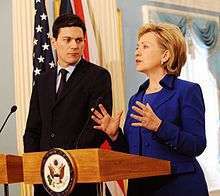 Miliband with U.S. Secretary of State Hillary Clinton, February 2009. On 28 June 2007, the day after Gordon Brown became Prime Minister, Miliband was appointed Foreign Secretary. He was Britain's third youngest Foreign Secretary and the youngest person to be appointed to the post since David Owen (in office 21 February 1977 – 4 May 1979). Anthony Eden had assumed office at the age of 37 in 1935. David's younger brother, the economist Ed Miliband, was the Secretary of State for Energy and Climate Change, making them the first siblings to serve together in Cabinet since Edward, Lord Stanley and his brother Oliver in 1938. On 5 February 2009, Miliband made a statement to the House of Commons concerning Guantanamo Bay detainee and former British resident Benyam Mohammed. A week later Mohamed’s American lawyer Yvonne Bradley flew to Britain to urge the Foreign Office to press harder for his release. On 23 February 2009, Benyam Mohammed returned to Britain and was granted temporary residence. However, in July 2010, Clive Stafford Smith accused former Foreign Secretary David Miliband of "fighting tooth and nail" to prevent the release of vital documents during the Binyam Mohamed case. According to Wikileaks, this was reported by Richard Mills a United States Embassy worker in UK. "with UK elections on the horizon and many Tamils living in Labour constituencies with slim majorities, the government is paying particular attention to Sri Lanka, with Miliband recently remarking to Waite that he was spending 60 per cent of his time at the moment on Sri Lanka". The other contenders for the leadership were Ed Balls, Andy Burnham, Diane Abbott and David’s brother Ed Miliband, with David Miliband gaining the most nominations. The result of the contest was announced on 25 September 2010, the day before the start of the 2010 Labour Party Conference in Manchester. While David Miliband led the share of the electoral college votes in the first three rounds, he lost in the final round (50.65% to 49.35%) to his brother Ed. He announced on 29 September 2010 that he would be quitting frontline politics and would not be a part of his brother Ed's shadow cabinet. Miliband became the President and CEO of the International Rescue Committee on 1 September 2013. At the IRC, Miliband will be overseeing humanitarian aid and development programs in 40 countries, a global staff of 12,000 and 1,300 volunteers, and an annual budget of $450 million. Near the top of the IRC, Miliband again installed his former Special Political Advisor from London, Madlin Sadler. She became the aid agency's Chief of Staff. In 2015 it was revealed that Miliband's salary at the IRC was $600,000 per year, almost $200,000 more than his predecessor. The IRC has been responding to Syria's refugee crisis. On the ABC News programme of 13 October 2013, This Week with George Stephanopoulos, David Miliband commented that he worried about the immediate effects of the current diplomatic solution in Syria of sending in Chemical Weapons Inspectors and destroying the chemical stockpiles would have on the ongoing crisis. He said: "We’re concerned that people think that somehow, because the chemical weapons seem to be addressed, that the Syrian conflict, the regional conflict, is done and dusted.” On 10 October 2013, David Miliband said there were huge risks in not intervening militarily. "We've got people on the ground, not just in Syria but in Turkey, Lebanon, Jordan and Iraq,” he told a foreign policy discussion in Manhattan. “I’ve got people who are in danger.” He quoted Frederick the Great, saying: “Diplomacy without weapons is like music without instruments”. His policy opinions were at odds with his younger brother, Ed Miliband, the Labour Party's Leader in the UK who insisted that the Labour Party will not back military intervention. On KPBS TV, Miliband revealed that the IRC was running cross border aid to Syrians beyond the scope of the United Nations. Miliband said such "cross border aid" has reached about a half million Syrians with medical aid in cities that were "besieged and cut off from the UN help". Another half million Syrians, said Miliband, had received non-medical aid. Mr Miliband stated that in the UN's absence, "It comes to International NGOs, non governmental organisations, to get across the border crossings and weave their way between the conflict lines to reach people." He stated the need for such extraordinary efforts was great and the need for such ingenuity was even greater. On 10 November 2013, IRC CEO David Miliband ordered the war relief agency to mount an emergency response to a natural disaster—Typhoon Haiyan in the Philippines. Miliband announced a huge donation drive for funds dedicated exclusively to the storm: "In the face of a rising death toll and widespread humanitarian catastrophe the International Rescue Committee (IRC) has dispatched an emergency team to Manila and launched a $10,000,000 appeal in order to implement the most appropriate response. We have today taken the decision to deploy emergency relief coordinators to the Philippines, with a view to deciding with the host government which of IRC's areas of expertise — from water and sanitation to education — are most needed. The IRC’s emergency unit will start work immediately." Miliband married Louise Shackelton, a professional violinist formerly with the London Symphony Orchestra, in 1998. Shackelton and Miliband have adopted two newborn sons from the United States, the first in December 2004 and the second in October 2007, and currently live in New York City. In an interview with CNN in 2009, Miliband stated that he grew up in a secular setting and describes himself as an atheist with a "huge respect" for people of faith. Miliband was portrayed by British actor Henry Lloyd-Hughes in the docu-drama Miliband of Brothers, with Ed Miliband being portrayed by Lloyd Hughes' brother Ben Lloyd-Hughes. In January 2012, David Miliband joined the Board of Directors of Mauritius-based private equity group, Indus Basin Holdings. IBH operates Rice Partners  in the Punjab region of Pakistan. It specialises in managing the end-to-end supply chain for major global users of rice. 1 2 "David Miliband — Somerville College Oxford". University of Oxford. Retrieved 24 May 2016. ↑ "MIT CIS: David Miliband Joins CIS". web.mit.edu. Retrieved 24 May 2016. ↑ "David Miliband – President & CEO of the International Rescue Committee (IRC)". rescue.org. Retrieved 24 May 2016. ↑ Mulholland, Hélène (29 September 2010). "David Miliband quits frontline politics". The Guardian. London. Archived from the original on 1 October 2010. Retrieved 29 September 2010. 1 2 "David Miliband to step down as MP". BBC News. 26 March 2013. Archived from the original on 27 March 2013. Retrieved 26 March 2013. ↑ "May 2 the likely date for South Shields by-election". Shields Gazette. 28 March 2013. Archived from the original on 2 October 2013. Retrieved 29 September 2013. 1 2 "Being Jewish must have an influence on the way I think. I am the child of Jewish immigrants and that is a very important part of my identity." – from Josephs, Bernard (22 December 2006). "David Miliband: Red to green in a generation". The Jewish Chronicle. Archived from the original on 16 October 2009. Retrieved 30 November 2009. ↑ Mendick, Robert (16 May 2010). "The miraculous escape of Marion Miliband". The Daily Telegraph. London. Archived from the original on 23 May 2010. Retrieved 7 June 2010. ↑ Birnbaum, Norman (30 March 2009). "The half forgotten prophet: C. Wright Mills". The Nation. Archived from the original on 23 March 2014. Retrieved 30 January 2014. ↑ Levy, Geoffrey (1 October 2013). "The man who hated Britain: Red Ed's pledge to bring back socialism is a homage to his Marxist father. So what did Miliband Snr really believe in? The answer should disturb everyone who loves this country". Daily Mail. Archived from the original on 1 October 2013. Retrieved 30 January 2014. ↑ Luke Harding (30 May 2008). "Luke Harding: Moscow diary". The Guardian. London. Archived from the original on 31 May 2008. Retrieved 16 March 2010. ↑ Porter, Andrew (9 September 2008). "David Miliband four-letter abuse from Russian foreign minister". The Daily Telegraph. London: Telegraph Blogs. Archived from the original on 16 February 2010. Retrieved 16 March 2010. ↑ Andy Beckett (28 February 2004). "In the house of the rising sons". The Guardian. Archived from the original on 20 September 2009. ↑ "Biographies: Lipman, Miliband & Saville". The Lipman-Miliband Trust. 15 August 2007. Archived from the original on 31 October 2007. Retrieved 22 October 2007. ↑ Kamil Tchorek (24 June 2009). "David Miliband visits family grave in Poland". The Times. London. Retrieved 28 June 2009. ↑ "European renewal amidst global adversity (23/06/2009)". Foreign & Commonwealth Office. 23 June 2009. Archived from the original on 27 September 2012. Retrieved 28 June 2009. ↑ McIntyre, Annette (24 June 2010). "...and that he would never be a professional footballer". Telegraph & Argus. Archived from the original on 15 June 2013. Retrieved 10 January 2012. ↑ "Meet the new boy". The Guardian. 4 June 2002. Archived from the original on 11 September 2007. ↑ Pierce, Andrew (30 July 2008). "Profile of Foreign Secretary David Miliband". The Daily Telegraph. London. Archived from the original on 9 September 2009. Retrieved 7 June 2010. ↑ "A Levels discussed". BBC News. 17 August 2003. Archived from the original on 26 May 2004. Retrieved 2 May 2007. ↑ "David Miliband Biography". Archived from the original on 9 February 2005. Retrieved 22 September 2008. ↑ "Commission on Social Justice". IPPR. Archived from the original on 8 September 2007. Retrieved 3 August 2008. ↑ "Heir to Blair?". The Observer. London. 20 October 2002. Archived from the original on 5 April 2006. Retrieved 3 May 2007. ↑ Sparrow, Andrew (8 March 2010). "Miliband challenged over ministers' explanations for Iraq war decision". The Guardian. Archived from the original on 4 November 2013. ↑ "Privy Council Members". Archived from the original on 24 December 2008. Retrieved 12 September 2008. ↑ Assinder, Nick (5 May 2006). "Reshuffle seeks to rejuvenate". BBC News. Archived from the original on 28 June 2006. Retrieved 2 May 2007. ↑ "Speech by the Rt Hon. David Miliband MP – "One planet farming" at the Royal Agricultural Show, Monday 3 July 2006". DEFRA. 4 July 2006. Archived from the original on 6 June 2007. Retrieved 2 May 2007. ↑ Deedes, Henry (16 June 2006). "£40,000 – the real cost of reading David's diary". The Independent. London. Archived from the original on 21 April 2009. Retrieved 27 July 2006. 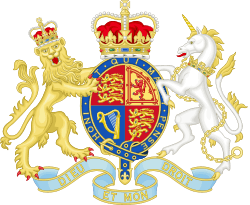 ↑ "Written Parliamentary Question on cost of blog". Hansard. 16 June 2006. Archived from the original on 25 August 2006. Retrieved 11 September 2006. ↑ "Miliband questions organic quality". ePolitix.com. 7 January 2007. Archived from the original on 19 June 2007. Retrieved 2 May 2007. See also: "Making the Most of Organic Food". DEFRA. 8 January 2007. Archived from the original on 9 June 2007. Retrieved 2 May 2007. ↑ Miliband, David (6 June 2007). "Greening the American Dream". DEFRA. Archived from the original on 9 June 2007. See also: United Nations General Assembly Session 62 Verbatim Report 9. A/62/PV.9 page 45. Mr. Miliband United Kingdom 27 September 2007. Retrieved 12 November 2007. ↑ "Wiki Wickedness". Global & General Nominees LLC. 1 November 2006. Retrieved 1 September 2006. ↑ "'Now or never' for climate action". BBC News. 18 February 2007. Archived from the original on 20 May 2012. Retrieved 2 January 2010. ↑ "Carbon 'credit card' considered". BBC News. 11 December 2006. Archived from the original on 19 January 2007. Retrieved 2 May 2007. ↑ Traynor, Ian (14 December 2007). "Miliband plays stand-in at lavish EU relaunch". The Guardian. London. Archived from the original on 15 December 2007. Retrieved 1 April 2010. ↑ Hansard: Volume No. 470 Part No. 34 House of Commons Debates January 21, 2008 and see Division #50. ↑ "UK apology on US terror flights". BBC News. 21 February 2008. Archived from the original on 25 February 2008. Retrieved 21 February 2008. ↑ "Miliband statement on Benyam Mohammed". TheyWorkForYou. 5 February 2009. Archived from the original on 17 February 2009. ↑ "Freed detainee 'happy to be home'". BBC News. 23 February 2009. Archived from the original on 23 February 2009. Retrieved 26 December 2009. ↑ "Military lawyer who freed Mohamed". BBC News. 24 February 2009. Archived from the original on 27 February 2009. Retrieved 26 December 2009. ↑ "David Miliband: 'War on terror' was wrong". The Guardian. London. 15 January 2009. Archived from the original on 17 January 2009. Retrieved 15 April 2010. ↑ Kapil Komireddi (23 January 2009). "Keep out of Kashmir". The Guardian. London. Archived from the original on 25 January 2009. Retrieved 16 March 2010. ↑ Merrick, Jane (18 January 2009). "Miliband's trip to India 'a disaster', after Kashmir gaffe". The Independent. London. Archived from the original on 23 April 2010. Retrieved 16 March 2010. ↑ "David Miliband comments on Kashmir welcomed by 'terrorist' group". The Daily Telegraph. 18 January 2009. Archived from the original on 22 January 2009. ↑ Page, Jeremy (26 April 2009). "David Miliband heads to Sri Lanka to urge ceasefire". The Times. London. Archived from the original on 9 May 2009. Retrieved 1 April 2010. ↑ "Monks protest Miliband visit". Archived from the original on 30 November 2010. ↑ "Effigy of David Miliband burnt on streets of Sri Lankan capital". The Times. London. Archived from the original on 19 May 2009. ↑ "WikiLeaks: David Miliband 'championed aid to Sri Lanka to win votes of Tamils in UK'". The Daily Telegraph. 2 December 2010. Archived from the original on 5 December 2010. ↑ "Wikileaks cables: David Miliband focused on Sri Lankan war 'to win votes'". The Guardian. Archived from the original on 4 December 2010. ↑ "Radio 4 Programmes – Great Lives, Series 19, Joe Slovo". BBC Radio 4. BBC News. Archived from the original on 15 August 2009. Retrieved 16 March 2010. ↑ Hélène Mulholland and agencies (17 August 2009). "Miliband attacked over terrorism comments". The Guardian. London. Archived from the original on 17 August 2009. Retrieved 16 March 2010. ↑ Patrick Hennessy; Bruno Waterfield (11 October 2009). "... or it could be Miliband, the EU international overlord". The Sunday Telegraph. HighBeam Research. p. 8. Archived from the original on 20 November 2009. ↑ Morris, Nigel (2 November 2009). "Miliband 'will stay in government'". The Independent. p. 8. ↑ "Baroness Ashton appointed as EU's foreign policy chief". BBC News. 19 November 2009. Archived from the original on 20 November 2009. Retrieved 25 November 2009. ↑ Stringer, David (23 March 2010). "UK expels Israeli diplomat over Dubai case". Yahoo! News. Associated Press. Archived from the original on 5 April 2014. Retrieved 26 March 2010. ↑ Miliband, David (29 July 2008). "Against all odds we can still win, on a platform for change". The Guardian. London. Archived from the original on 31 July 2008. Retrieved 2 August 2008. ↑ "Miliband calms leadership talk". Reuters. 31 July 2008. Archived from the original on 12 January 2009. Retrieved 2 August 2008. ↑ "Miliband denies 'leadership' bid". BBC News. 30 July 2008. Archived from the original on 31 July 2008. Retrieved 2 August 2008. ↑ Allegra Stratton (12 May 2010). "David Miliband announces Labour leadership bid". The Guardian. London. Archived from the original on 13 May 2010. Retrieved 7 June 2010. ↑ "Barry Sheerman nominates David Miliband for Labour leader". Huddersfield Daily Examiner. 10 June 2010. Retrieved 24 November 2013. ↑ Hélène Mulholland (29 September 2010). "David Miliband quits frontline politics". The Guardian. Archived from the original on 1 October 2010. ↑ Singh, Anita (11 January 2011). "David Miliband to become a teacher". The Daily Telegraph. London. Archived from the original on 13 January 2011. ↑ "Oxford Analytica – DavidMiliband". Oxan.com. Archived from the original on 16 May 2011. Retrieved 26 March 2013. ↑ Robert Booth (27 March 2013). "David Miliband faces a diplomatic test at the IRC". The Guardian. Archived from the original on 28 March 2013. Retrieved 28 March 2013. ↑ "David Miliband 'feared being distraction' for Labour". BBC News. 27 March 2013. Archived from the original on 27 March 2013. Retrieved 28 March 2013. ↑ "David Miliband, Former UK Foreign Secretary, Takes Helm of International Rescue Committee". U.S. Newswire. New York City. PR Newswire. 3 September 2013. Archived from the original on 2 November 2013. Retrieved 24 November 2013. ↑ "IRC Leadership". International Rescue Committee (IRC). Archived from the original on 2 November 2013. Retrieved 24 November 2013. ↑ Shakespeare S (31 December 2015). "Revealed – David Miliband is paid a staggering £425,000 as boss of New York-based refugee charity". Daily News. Retrieved 1 January 2016. ↑ "Rescue and Refugee Support". Rescue.org. Retrieved 24 November 2013. ↑ Crowder, Anja (13 October 2013). "David Miliband Calls Nobel Peace Prize Award 'A Bit of an Irony'". ABC News. Archived from the original on 13 October 2013. Retrieved 24 November 2013. ↑ Jon Swaine (10 October 2013). "David Miliband warns of 'huge risks' of Western retreat from international engagement". The Daily Telegraph. Archived from the original on 11 October 2013. Retrieved 24 November 2013. ↑ Holehouse, Matthew (6 September 2013). "Syria crisis: Tony Blair criticises Ed Miliband's stance on military action". The Daily Telegraph. Archived from the original on 9 September 2013. Retrieved 24 November 2013. 1 2 Megan Burke; Peggy Pico (28 February 2014). "International Rescue Committee's David Miliband On What U.S. Can Do To Help Syrian Refugees". KPBS. Archived from the original on 3 April 2014. Retrieved 3 March 2014. ↑ "International Rescue Committee deploys to Philippines in response to Typhoon Haiyan" (Press release). International Rescue Committee UK (IRC-UK). 11 November 2013. Archived from the original on 2 December 2013. Retrieved 24 November 2013. ↑ "David Miliband 'Could Earn Hundreds Of Thousands Of Dollars' At International Rescue Committee". The Huffington Post. 27 March 2013. Retrieved 24 November 2013. ↑ Prince, Rosa (8 May 2009). "Daily Telegraph: David Miliband". The Daily Telegraph. London. Archived from the original on 11 May 2009. Retrieved 13 May 2009. ↑ Wheeler, Brian (29 September 2010). "The David Miliband Story". BBC News. Archived from the original on 22 May 2013. Retrieved 29 September 2013. ↑ Vivienne Russell (3 February 2006). "Miliband makes his mark". PublicFinance. ↑ "David's Story". Archived from the original on 5 March 2011. ↑ Andrew Norfolk (31 December 2004). "Blair's lieutenant adopts American baby". The Times. London. Retrieved 15 May 2007. (subscription required (help)). ↑ "David Miliband adopts second son". BBC News. 29 October 2007. Archived from the original on 31 October 2007. Retrieved 29 October 2007. ↑ Clout, Laura (13 June 2008). "David Miliband speaks of adopting his sons". The Daily Telegraph. London. Archived from the original on 20 June 2008. Retrieved 11 May 2010. ↑ Sarah Lyalll (6 December 2013). "An Englishman in New York". The New York Times. Archived from the original on 31 August 2014. Retrieved 21 April 2014. ↑ "Interview With David Miliband". CNN. 5 July 2009. Archived from the original on 15 July 2009. Retrieved 24 January 2010. 1 2 Pickard, Jim (18 January 2013). "Spotlight cast on David Miliband earnings". Financial Times. Archived from the original on 22 January 2013. Retrieved 24 November 2013. ↑ "Global Advisory Board". Macro Advisory Partners. Archived from the original on 2 November 2013. Retrieved 24 November 2013. ↑ "Indus Basin Holdings – Businesses". Indus Basin Holdings. Archived from the original on 2 December 2013. Retrieved 24 November 2013. ↑ Tirmizi, Farooq (25 October 2011). "Cutting out the middleman: Global food giant to buy Pakistani rice directly from the paddy". The Express Tribune (Pakistan). Archived from the original on 25 October 2011. Retrieved 24 November 2013. ↑ Tirmizi, Farooq (21 January 2012). "High connections: David Miliband joins Pakistani private equity firm". The Express Tribune. Archived from the original on 3 December 2013. Retrieved 24 November 2013. ↑ "Advisory Council |". VantagePoint Capital Partners. Archived from the original on 13 May 2012. Retrieved 24 November 2013. ↑ "THE TRILATERAL COMMISSION JANUARY 2013" (PDF). The Trilateral Commission. Retrieved 23 March 2015. "David Miliband, Member of the British Parliament; former Secretary of State for Foreign and Commonwealth Affairs, London"